4 Differences is the sequel to 5 Differences and 6 Differences, two very popular games in the Spot-the Difference genre created by Case Hollingsworth. This third installment features 13 levels “or something like that”, and is as good as its predecessors, if not better (and a bit easier too). 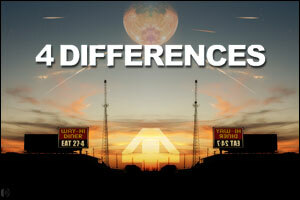 With its wonderful animations and a very nice and relaxing music, 4 Differences is a must play! Game’s file updated, it should be fine now! Awesome! I knew if you did more, I would be driven to finish it without help, and so it goes! I love this type of game. I’m off to play the other new one, and thank you, so much for all of them. Posted on Tuesday, February 2nd, 2010. Follow any responses through the RSS 2.0 feed.